Now through Friday is the virtual launch of my new book, No, wait… You do look gay! The 7 Mistakes Preventing You from Selling to the $830 Billion LGBT Market. (www.nowaityoudolookgay.com) It is a really unique book packed with marketing and sales advice to any business owner or professional looking to reach the widely untapped LGBT market. My goal is that this book becomes an Amazon Best Seller during this time frame. At the time of writing this podcast post, it is sitting at #7! Can we get to #1, together?? I could use your help so that I actually have a shot at achieving this goal. Would you be willing to share posts on your social media between August 21-22? As an incentive to purchase during the virtual launch, I am offering a super low Kindle price ($5.99) during those 4 days and I am giving purchasers free access to my online training course ‘Defining Your LGBT Target Market’ (normally $97) completely free. There is something beautiful about having just bumped into the first page! None of this would be happening if it weren’t for this incredibly supportive network of friends and colleagues – thank you all from the bottom of my heart, I really appreciate you! 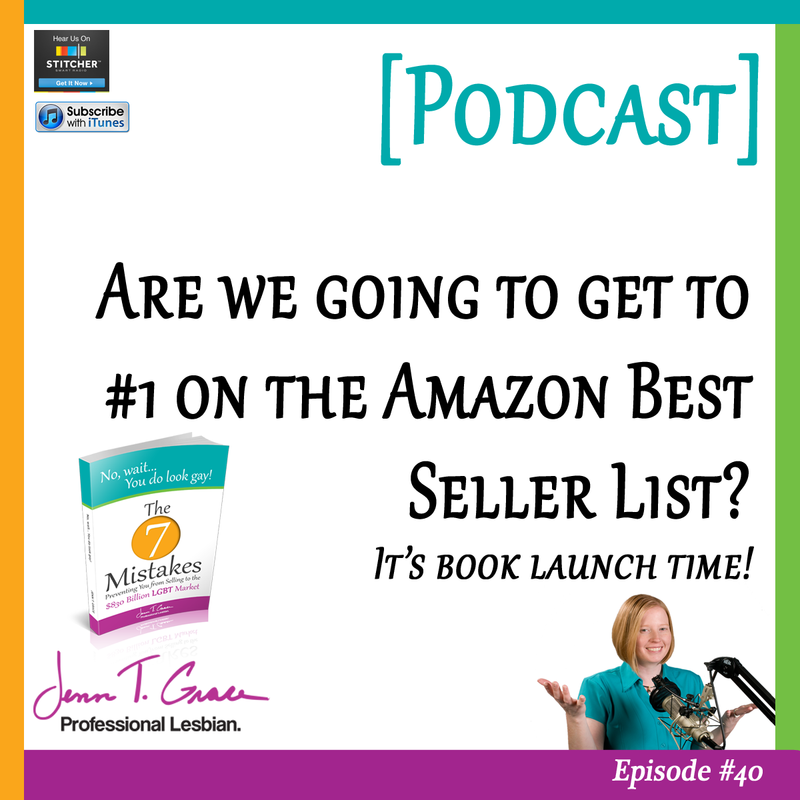 You are listening to the Gay Business and Marketing Made Easy Podcast, Episode 40. Well hello and welcome to episode number forty of the podcast. I am your host, Jenn Grace, and today is going to be an extra brief episode because I am in the middle of launching my second book, ‘No Wait, You Do Look Gay: The Seven Mistakes Preventing You From Selling to the $830 billion LGBT Market.’ And I have been talking about the book launch for a while, but today is the day. Actually this past week has been the week. So on Monday I began reaching out to folks in my network asking them if they would be willing to post something on social media, whether it’s on Facebook, LinkedIn, Twitter, maybe send something to their audience in an email, newsletter, whatever it happens to be. 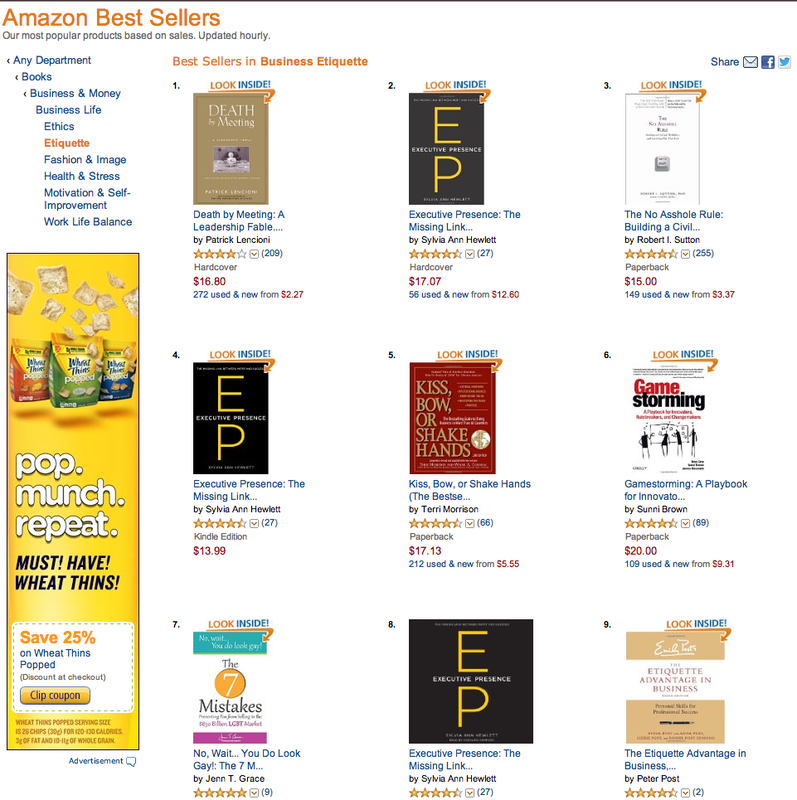 And I personally have the goal, and the goal still stands because the launch is from August 19th through the 22nd, and today is August 20th, and the goal is to make it to number one in the Business and Money category on Amazon in the Etiquette section. So I have picked a really broad topic, or a broad category, trying to rank in on Amazon. And right now as it stands of this recording, I am in the number nine slot. So I have made it to the top ten bestselling list on Amazon, and I can’t even being to explain how super excited I am at the moment. Right before I was about to hit record on this podcast I happened to do a refresh, and I went from number fourteen up to number nine. So my goal is still really strong of trying to get to number one. When I first started this out I had no idea if it would be even remotely attainable, but now looking, sitting here in the number nine slot, I feel like it’s possible. I just have a lot of hope, it’s possible. I just want to say thank you to those of you who are listening who have participated in the sharing of this information. It is amazing, and I mean absolutely amazing and mindboggling to me to have received such the amount of support I have. It is incredible. I have a very large network of friends, and family, and colleagues, followers, and it took me a significant amount of time on Monday to go through and email everybody one by one. And some of you who have received the email, you may have thought maybe it looks a little bit like it’s a canned message, but please rest assured that I individually sent every single email out, which took a ridiculous amount of time. However I am very happy to report that all of that time putting in it has been very well spent, because here I am sitting in the number nine slot, and having received so many just really gracious emails from all of you with all of your support. So thank you so much for participating in the launch of this book. Only a couple things to mention today..
Like I said this is going to be a really short episode but I do want to tell you just a couple of things about the book itself. So you’ve been hearing me talking about this book for at least I would say six weeks; probably the last couple of podcast episodes you’ve heard me talking about this. And one of the episodes I went into a really deep dive on what you can actually expect from the book. So right now you can purchase the book on Kindle for a lower price than it would typically be priced at, at $5.99. Or I think Amazon- the paperback version right now is something like $14.00 or something like that. I don’t know if it’s called the MSRP, whatever the retail price is $15.95 so Amazon’s got it down by a couple of bucks. But one thing that I’m doing to really incentivize you to buy it right now if you haven’t already, is I’m giving anyone who buys it and just shoots me an email says, “Hey I bought it. Attaching the receipt, forwarding the receipt,” whatever it happens to be. I’m giving you access to the training module of my full online training course. The section that’s actually section number seven, and it’s Defining Your LGBT Target Market. And I really love this module because it just goes into really how to identify who your target market is. And while the book this time around really focuses on the communications piece, and the do’s and don’ts and what to say and what not to say, there is a lot of marketing talk in the book. So it’s a really good kind of companion to the book itself. So typically this one piece would cost $97.00, it’s totally free. It’s just completely, just shoot me an email, tell me about the book, and I will send you over the link to register and watch the video. It’s about an hour and three minute long I think is what the running time is. It’s really meaty, it’s packed with information, and whether you buy the Kindle at $5.99 or the printed one for $14.00, you still get this $97.00 value. It’s pretty cool and I’ve already sent out a link to at least three dozen people today, so I know that you’re out there and you’re buying, and you’re really excited about the book. So I am pretty jazzed up about that myself. Another thing that I actually haven’t even mentioned in any of my book promotion, and today is Thursday and the book launch is going into Friday, so I had a four day window, and I’m basically just trying to figure out what Amazon’s algorithm is because I truly don’t know how exactly they do their rankings. But the more people buying, the more people reviewing clearly has significant weight in jumping this number around. So if you buy the printed book, there’s something on Amazon called Matchbook, and basically that means if you buy the printed version you can get the Amazon Kindle version for $2.00 extra. So it ends up being kind of like a little thank you, and just a nice little added bonus of being significantly reduced in price. Just throwing that out there in case anyone is buying the printed book and you want to just throw in the- match it with the $2.00 Kindle book. I do want to just throw that out there in addition to all the other things. If we ran into one another at the NGLCC conference which was just a couple of weeks ago as of the airing of this podcast, and I gave you one of the printed copies of my book, because I was very much like Mary Poppins, just kind of sprinkling my books around to fellow certified businesses, to friends, to Chamber leaders, to a lot of people, and I handed out a good amount of copies of them. If I gave you one of those books, and you have read it- and I’ve actually got a lot of emails from folks saying, “I read half of it on my way back on the plane ride home,” or, “I’m halfway through it.” If you have the time and desire to leave me a review between now and Friday, which is tomorrow, that would be amazing. That would be seriously amazing. And I don’t want a fake review, I don’t want you to just give me five stars for the sake of giving me five stars. Although as it stands right now I do have eight five star reviews on Amazon for this book, so that’s super exciting. But if you felt like it deserved a one star, and you have a really good opinion for why that is, I want that too. I really want just your honest feedback and opinion on what you think about the copy, what you think about the content. And this goes for anyone who- you may be listening to this thinking, ‘I should just go buy that now.’ As you’re reading it, shoot me an email. I respond to each and every one of emails that I get. I do have an out-of-office type of reply happening right now where it just says, ‘Hey I’m in a heavy email load right now due to the launch of this book, so please be patient with my response.’ So if you do take the time to send me an email, just give me a couple of days to respond because I have hundreds of emails coming in over the last couple of days and I’m trying to address individually to make sure that I’m really thoughtful and mindful of your time for having emailed me, and I want to make sure that I’m really thoughtful in my response to you. So that is really kind of all I wanted to talk about on today’s episode. I have a crazy amount of energy right now, and a crazy amount of adrenaline because I have been watching the sales rank jump around since I started doing this on Monday evening. So on Monday evening- and I’m not editing this episode, so you’ll have to hear my notebook page flipping in the background here, and things falling off of my desk. It was at 2,519,246. That was its rank on Monday at 11:49 PM. And throughout- I’ve been taking screenshots as it’s been going through in terms of the rank slowly getting better and better. But at one point it was at like 96, then it was at 74, then it was at 64, then it was at 33, then it was at 20, 16, 14, and now 9. So whatever you guys are doing out there, I love you and I really appreciate this. Because I made it very clear in my intentions to my email, to everybody I’ve said it to that, “Hey I’m trying to get into number one,” and you have been all so gracious in going above and beyond in terms of retweeting and sharing and all that stuff. So I’m getting there, and it’s really I cannot do it without you. So we’re at number nine now, hopefully by the time you’re recording this I’m doing some sort of song and dance in a video for you saying that we’ve hit number one, because that would be really cool. And one of the things is that I did pick a really big category, like the business and money category in books is there’s a lot of competition in there. Versus picking a niche like LGBT which I probably- and I don’t want to take it for granted, but if I had picked just LGBT, I probably would have hit number one really quickly, because there’s just not a lot of competition in that category. So I picked the bigger category because ultimately this is about business, it’s about money, it’s about helping you make more money in your business, and it’s really around etiquette. 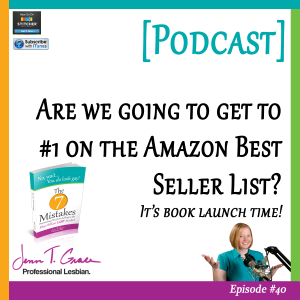 So ultimately I just want to make sure that you know how to communicate properly with your potential LGBT customers, and this book really is the one that can help you do that. So like I said, thank you so much, I really appreciate it. And if I’m talking really, really fast I apologize. Like I said I’m just kind of really amped up right now. So hopefully by the time we speak again, and we converse at some point via email, via phone, me and my carrier pigeons- one day someone will send me a carrier pigeon, I swear. Hopefully at that point we can talk about how we together hit that number one spot. So fingers crossed, I’m really just kind of hoping and praying that between now and Friday, it just keeps getting better and better. So thank you so, so much for all of your support, I really appreciate you more than you probably understand. So it occurred to me that after I hit stop on this recording, I didn’t tell you where to find the book. So if you are interested in checking out more details for it, head on over to www.NoWaitYouDoLookGay.com and that will bring you right to a page that has all sorts of information about the book. You can also just type that title into Amazon and it will come right up. And the hashtag that I’m using is #SellToLGBT. Thank you again and we’ll talk soon. ← What is so symbolic about the rainbow within the LGBT community?